I accomplished almost nothing this weekend, it was grim and rainy and I felt like I had the ague coming on. So, I missed the local library sale, no big deal, I had sworn those off ages ago when faux booksellers started swarming in and shopping with shovels. But after spending Saturday under the bed clothes curled up in a fetal position, I forced myself to dress and leave the house on Sunday and toddle up to The 32nd Annual New Hampshire Antiquarian Book Fair which was up in Concord. I had sworn off attending this little fair. A couple of years ago it had been a waste of effort for the vendors and a ghost town as far as attendance. But something went right this time, perhaps it was a change in organizer, perhaps because it’s no longer held on a race weekend, perhaps it was planetary alignment, who knows? If we could bottle it, we’d make a mint. I arrived late and it was STILL in full attendance, no lie. Yes, the internet has given realworld book fairs a royal disembowling – but if Concord was any indicator, they have finally gotten off the mat. Where once you went from booth to booth browsing the same modern firsts and trendy collectibles, now aside from obligatory wealth of New Hampshirania, you had to look very hard to find stock overlap. A lot of heavy hitter New England booksellers were in attendance, with a smattering from elsewhere, Canada, NY, even Ohio. A large part of the stock on display was an vast array of items that sell better In Real Life, then they do on the PC: illustrated childrens books, prints, vintage paperbacks, postcards, and ephemera- miles and miles of it. With the internet strangling brick and mortar stores and driving booksellers back into their homes, bookfairs are an occasion where vendors get to dust off their bestest stuff and bring it out to meet the folks. People are finally bringing the stuff from the back rooms, and bottom of the box. 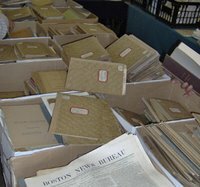 Some stuff hasn’t even been owned long enough to get dusty: Geo Sutton, Lyman ME, had a ton of boxes of vertical file material recently expelled from the Maine Historical Society – messy mixed media just waiting to be rooted through. Admit it, an unsorted box is pretty much a never-fail fishing lure for booksellers. My personal indicator about a book fair’s success, is whether I buy something or not. Big boy fairs – NY or Boston are fun to wander through, but I only get to buy something once a decade. Previous fairs filled with modern firsts and childrens series titles were incredibly boring. But folks, I brought three paper checks to this fair and scribbled every one of them. 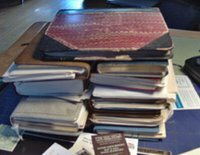 I upgraded my copy of Watson’s Hand Bookbinding, I scooped an unpublished journal of 1900’s poetry (better than Sominex) and a shoe box full of 1960’s handwritten travel journals – an even better sleep aid than bad poetry. So, a good time was had by me anyways . . . and that’s what’s really important.